The growth prospects of Brazil, Russia and China are dimming, while those of India are flaring. If one is a lonely number, then ‘I’ could be a lonely letter, at least when it comes to the ‘I’ of the BRIC countries. Brazil, Russia and China all face mounting challenges in 2015 but the road ahead seems wide open for India. The main concern with this opening statement is that it seems to be the view of a large majority of observers. Still, a majority is not the same as a consensus and certainly not the same as an extreme consensus. In investing, the consensus view is often right but the extreme consensus is absolutely and always wrong. For example, the consensus to buy tech stocks in 1997 was right but the extreme consensus to sell all non-tech and buy only tech in early 2000 was very wrong. When it comes to India, we are with the majority view, edging into consensus territory, but still far from extreme consensus. There remain enough doubters to ensure that this story still has plenty of time to play out. Our approach to the topic is resolutely from the point of view of demographics. Demographics are not the be all and end all of an economy, but they are a very important vector, one of three very important vectors, the other two being innovation and institutional strength. Looking at the BRIC countries, the demographics of Russia and China are poor and those of Brazil are neutral. By contrast, the demographics of India, though challenging due to the large population size, could hold much promise if this huge newly created human energy can be harnessed and channelled in the right directions. In general, the best demographic profile for an economy would be a rising population coupled with a declining dependency ratio (the ratio of dependents to workers). The increase in population means that demand for goods and services continues to grow. And the declining dependency ratio means that there is plenty of discretionary capital for consuming and for investing. The US, Europe and China were in this sweet spot until six or seven years ago. Indeed, much of the world was in this sweet spot, a fact which largely explains the enormous creation of wealth and improvement in living conditions for billions of people in the past few decades. Things got more challenging in the middle of the last decade when dependency ratios in several countries bottomed out and started to rise. We can’t blame the 2008 crisis on demographics alone. There were many abuses and excesses in the system which brought about the crisis. But it is worth noting that the crisis struck about the same time that a big reversal in demographics was taking place. A crisis would have come any way but instead of 2008, perhaps it would have come in say 2012 if the dependency ratio had bottomed four years later than it did. 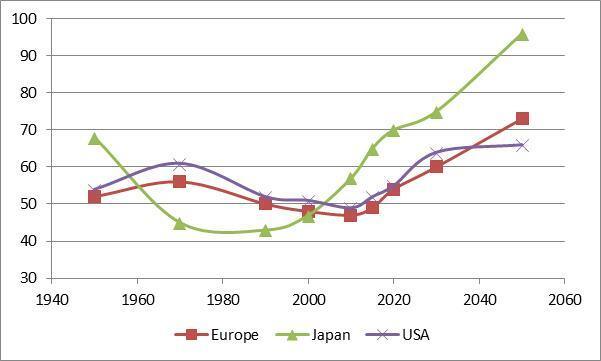 Nor should anyone be surprised that Japan peaked in the late 1980s and has been struggling since then. Its dependency ratio bottomed in the early 1990s. Or that China saw a huge boom since 1980 after it introduced its one-child policy, thus engineering a very steep decline in its dependency ratio. Or that the US recovery has been slow, given that its population growth has slowed down and its dependency ratio has been rising. 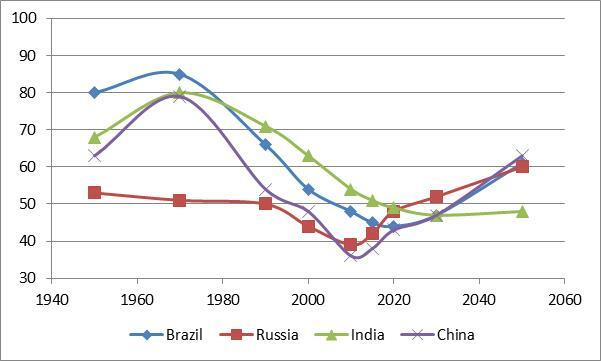 As shown in the first chart above, India is the only BRIC country with a declining dependency ratio between now and 2030. Russia and China’s are already rising and Brazil’s will bottom and rise by the end of this decade. Russia seems to be in the worst shape since it has both a declining population and a rising dependency ratio. Finally two quick words on the other big vectors of economic growth: innovation and institutional strength. Innovation in Brazil, China (ex-Taiwan) and Russia has been slow and cannot be considered a factor in future growth. There was plenty of excess capital to invest in new businesses when the dependency ratio was declining in all those countries but it went instead into real estate and other unproductive investments. Innovation has been slightly better in India and could take a big leap forward with more capital investments in the decades ahead. India also has an immeasurably greater competitive advantage compared to the other BRIC members: its population speaks English. Institutional Strength can be the subject of endless debate, especially if we try to draw comparisons across countries. All emerging countries have to make significant progress on this account. ← When Will Oil Bottom?